I ended my last post with the words “even I can manage an egg”. And really, how challenging can it be to produce a faceless vaguely oval shaped crochet object? As it turns out, for me, quite challenging. The first challenge to overcome was pattern selection. This necessitated a good deal of time scouring Ravelry (for my non knitting crocheting readers, it’s a website containing hundreds of thousands of patterns for everything you’d ever want to knit or hook). The trouble with Ravelry is that it’s very easy to get distracted. 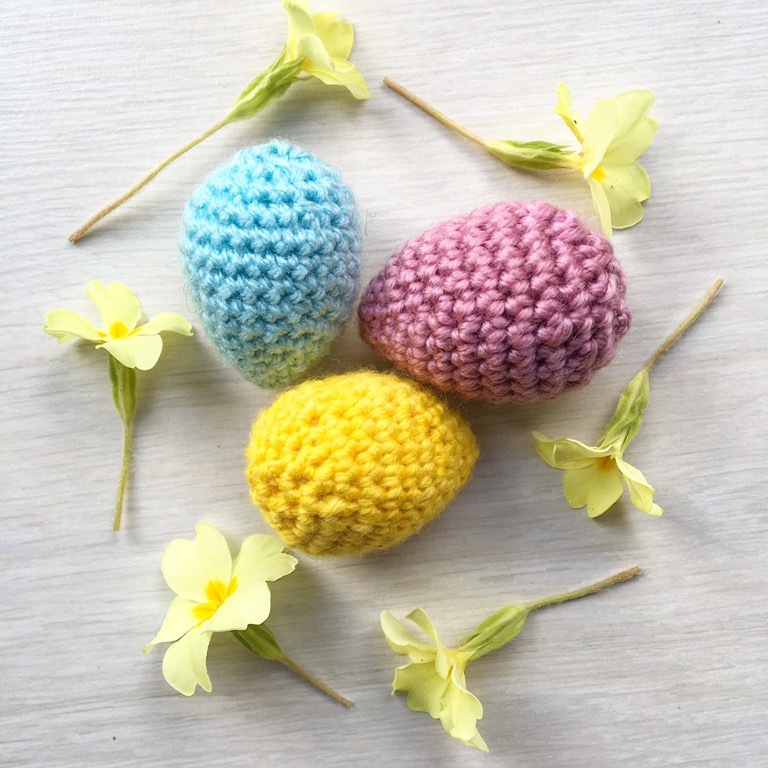 You start with the best of intentions, type in the word “egg” and press the search button and before you realise what has happened, an hour has passed, you are perusing shawl patterns and are nowhere near having an egg pattern selected. So, I buckled down and eventually picked a pattern. Pattern selected, the next decision was yarn. Clearly, I don’t want to buy any more yarn just to crochet a couple of Easter eggs (although as excuses go, I’ve used some which have been much more feeble than this) so I looked in my stash. Some time later, I realised I’d been horribly distracted again, by squeezing and squishing all my beautiful colourful hand dyed yarn, and so eventually settled on 2 shades of Stylecraft Special DK, an acrylic which I don’t especially love but I have loads left over from a previous Attic 24 blanket obsession, and a hand-dyed yellow from Cuddlebums, which I’d been saving for some daffodil brooches but thought I could probably spare an egg’s worth. So, on to the pattern. It assured me an egg would take about an hour to make, and it is true to say, the second and third ones were much quicker than that. The first one however took me the better part of an evening. It turns out that one of the reasons I’m not very good at amigurumi is that I can’t count. At least, not reliably, when there is good TV to watch. And counting, it turns out is the key to producing an object that looks at least a little bit like the pattern. About the first 10 attempts were frogged (translation for the benefit of non crafting folk: to unravel your work, or “rip it, rip it” back) or simply abandoned, when I decided that reusing yarn that had been previously crocheted wasn’t helping my cause. Eventually, and after a good deal of sighing, I did manage three egg shaped objects and I do have to say, I think they look really sweet. Now I’ve mastered (ahem!) the pattern, I may make some more but I think the Easter bunnies will need to wait until next year. However, I am now thinking surely all eggs need a nest? So, I’m off to have a scroll through Ravelry…. Ha ha, I know this so well ! “Lost in yarn” there should be a name for the addiction – wait til we get you spinning !!!!!!!!!! I love colours and they are so sweet. Can’t wait to see the nest. Enjoying the blog. Keep going! Loving your blog. Really looking forward to more. I’m having a go at a nest for my crochet tree. I’ll have to add some eggs.